From the Brits: US tracks follow. The race card, it normally is arranged as a line of numbers denoting finishing position or abbreviations. Form runs from left to right, with the oldest races on the left and the most recent on the right. The numbers 1-9 indicate the position the horse finished in the race. The number 0 indicates that the horse finished outside the first 9. The symbol - separates racing seasons. Numbers before the - are for last season. The symbol / indicates a longer gap, for example if the horse missed an entire racing season. P or PU indicates that the horse was pulled up by the jockey and did not complete the race. C indicates a horse has won on that course before. D indicates a horse has won over that distance before. CD indicates a horse has won over course and distance. There is so much information packed into a horse racing form that it is dizzying, overwheling and confusing! By learning how to read the race card you will have information necessary about the horse's performace to enable you to make an informed decision when betting. However, there are so many variables in a horse's performace that the information provided is only a helpful overview of past and perhaps future performace. Below is helpful information to help you understand a Horse Racing Form for horses running on the flat on a track, i.e., not over jumps, etc. The Racing Form or Race Card - Get on your reading glasses or have a magnifying glass near because the font is size 8! There is so much information provided in such a small space. 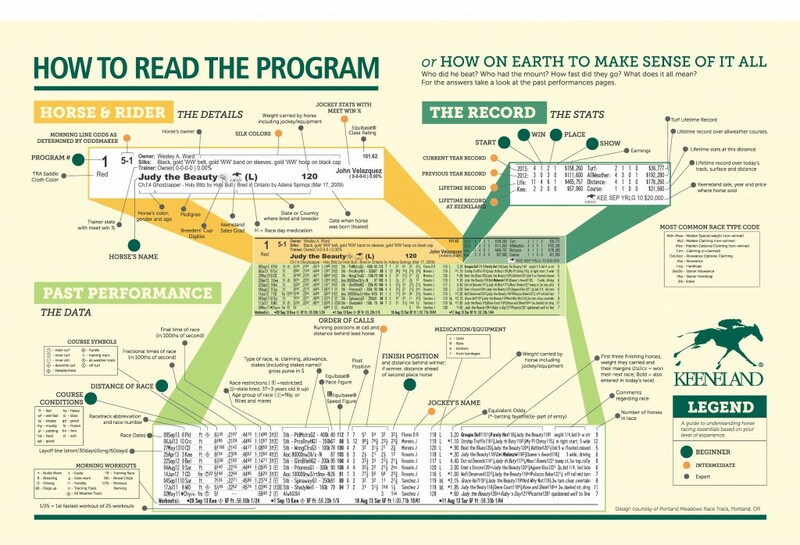 How to Read a Horse Racing Program"
This will usually be accompanied with information about it's owner and rider. Additionally, the all important silks will be pictured in the margin. This little picture is probably the most important piece of information in this section as it will enable you to recognise your chosen horse when it is running around the track. Race restrictions, ie handicap, age restrictions etc. Take particular note of the details with italics. ...Although there will be a series of numbers detailing the order of calls, singling out the final number which will designate the horse's position at the finish line should be enough to make a judgement. ...Beyond the horse and the jockey its important to consider what the terrain is like when you are analyzing and horse racing program. The course symbols are easy to overlook because they are designated by a series of very obscure abbreviations which can easily wash over a racegoer's head. If a horse won on a course which does not resemble the one they are racing on at a later date, then all bets will be off. After you have checked whether the horse's prowess is on Turf or Hurdle, it is important to verify the condition of the track. It may have been sloppy, muddy, hard or good, depending on the day. All of these minute details add up to create a complete picture of a successful horse. s: sealed: A track surface that has been packed down. A sealed dry tracks allows water to run off the track, reducing the amount of precipitation absorbed. Wet tracks are sealed to provide a safe and even racing surface. The Daily Racing Form has recently added a "s" next to the track condition on the past performances if the track is sealed. In practice this information is not required to secure a win. It is just useful to identify these symbols so that you are not thrown when you see these abbreviations on the program. If you are more advanced you may want to see whether a horse has improved automatically when they were put on Lasix or Bute. Claiming Races - What is a claiming race? A race in which the horses are literally for sale. Any claims must be made before the race, and the new owner assumes possession following the race. Claiming Race/What is It?